Export to Microsoft Word (docx) and LibreOffice/OpenOffice.org (odt): The developer Mahdi Jaberzadeh who participated in the OSCOSS project while he wrote his master degree in computer science at the University of Bonn spent many months working on a prototype converter. With his experience in mind, we were able to create filters both for docx and for odt. We continue to support our LaTeX, epub and HTML-export filters, and our LaTeX-exporter has been significantly improved, but additionally you now have the option to export to your favorite word processor! Table support: It’s finally there! This has been one of the most requested features since we started Fidus Writer in 2012! Firas Kassawat (Uni Bonn) has created a user interface for the great tablesystem Marijn Haverbeke of ProseMirror has invented. Review roles: Did you ever want to give someone the right to comment on your draft text, but not be able to read the comments of others? Or maybe you wanted someone to be able to read a text, but you didn’t want for that person to read the comments? Both of these options have been added now. This is only the first part of an integration between the OJS journal management system and Fidus Writer that Afshin Sadeghi (Uni Bonn) and Fakhri Momeni (GESIS: Leibniz Institute for the Social Sciences in Cologne) which we will see more of in Fidus Writer 3.2. Professional citation management: Back in 2012, developer Takuto Kojima already gave Fidus Writer one of the most professional citation tools of any online text editing system out there with a advanced yet clean interface by Anne Wittorf Kojima. Now we have expanded on what we have and are really proud of the result! The philosopher and developer Emiliano Heyns had been writing to us for years about all the various things that could be added. This time we finally managed to work with him to make a lot of his ideas available within Fidus Writer. We will be blogging a lot more about the new features of Fidus Writer 3.1 in the coming weeks! 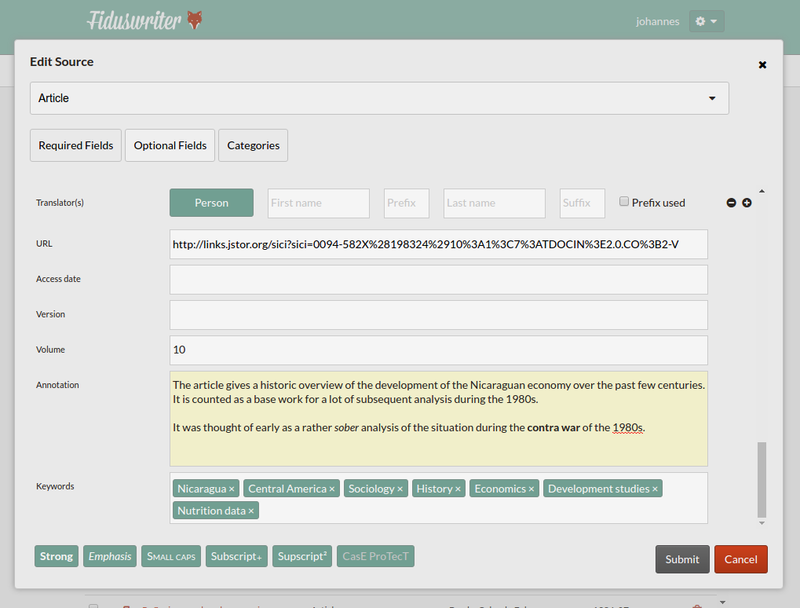 In the meantime, preview the upcoming version of Fidus Writer here now!